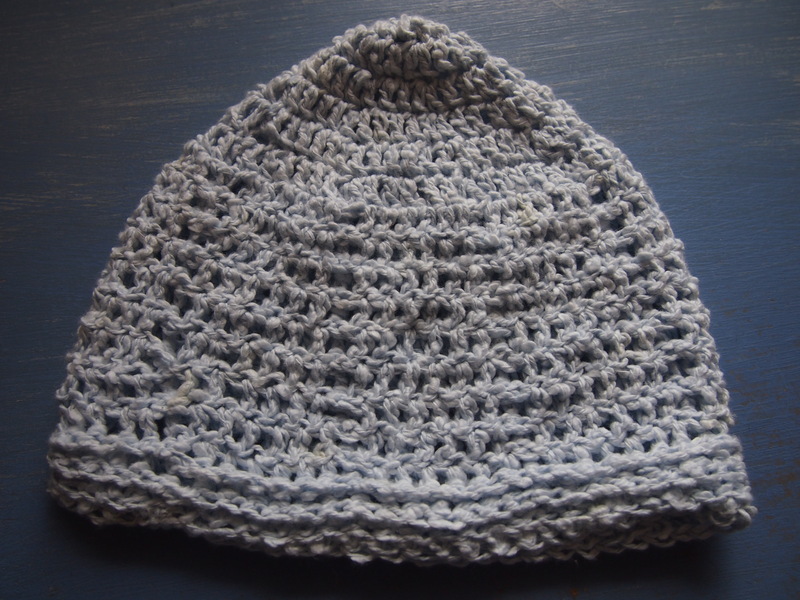 I used some very nice 100% blue cotton for this cap, intended for a 9 year old girl. I hope she likes it! Because the cotton has a bubble texture, I decided I needed a simple design for this cap. I chose to do ridges which you can see through the thick yarn, anything more delicate and you would have missed it. 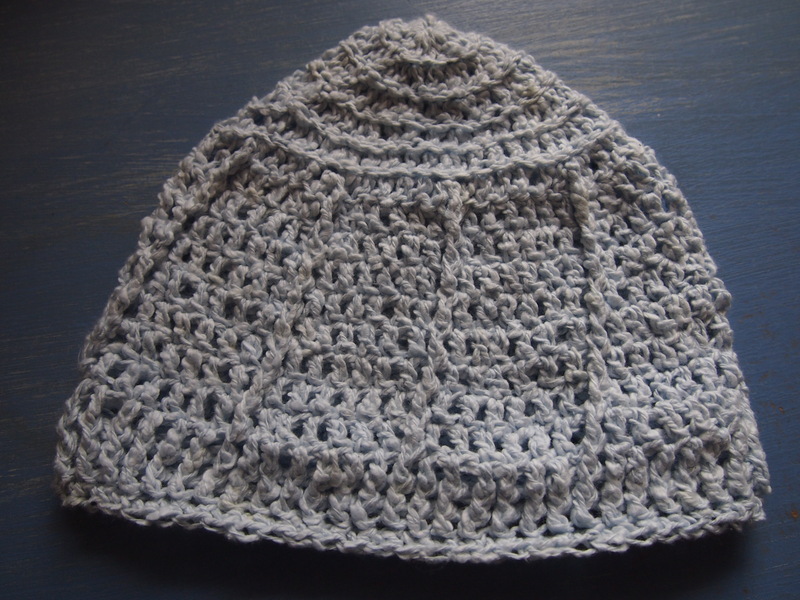 I started with a 3.5mm hook, because with thicker yarn than I used for the other caps I made for this recipient, the hat would not be the same size in the end. This one has 6 increasing rows, and one side of that section has horizontal ridges. These ridges are formed by only going through one part of the loop when you normally go through two. When the rounds stop increasing, I turned the cap over so the back became the front and the ridges on the underside were showing. Then I started making vertical ridges by going under the post. There are 8 rounds like that. Finally I made all the stitches in the next 2 rounds go behind the posts, making them all sit forward, and the reverse side had ridges. The very last round is a row of sc through one loop only to again create a ridge. Its a very ‘ridgy’ kind of cap! Hopefully the cotton will mean it ends up being a nice, cool one too! I’d already decided to make these to use up a bunch of dried basil flowers, and cut up the squares last Thursday afternoon. This project turned out to be a way for me to practice my embroidery, and I’m pleased with how that’s coming along. On Friday morning I was looking through the Transformation Thursday’s party link and found number beanbags at Lemon Tree Creations. I’d already planned my bags, so the ones at Lemon Tree are slightly different, but it’s still good to see how they do theirs. After I sewed the bags on my trusty Husqvarna 2000, I stuffed each one with three tablespoons of old lentils and dried basil flowers. I put 15 tablespoons of lentils and a big heap of basil flowers into a bowl, and then a spoon of lavender oil, so these bags smell lovely. A little aroma therapy there for the kiddies! I planned to do my stitches in thick contrasting coloured cotton. When I went to embroider the “D” on a hanky for David, I had a vague memory of my mum teaching me a chain stitch and tried to replicate it but had a lot of trouble. So for this project I did some research and looked up images of basic embroidery stitches and found a very helpful page at Tipnut. The chain stitch in particular came back to me easily. I also found some youtube videos on how to make a lazy daisy and a french knot.